Part of our full 18×7 construction stainless steel rope line up, this example measures 6mm in diameter and is thus the narrowest rope of this particular configuration that we currently produce. The multitude of wire strands used to construct 6mm 18×7 Stainless Steel Wire Rope ensures that it will resist wear and tear effectively. Wire rope which uses an 18×7 arrangement of bundles is surprisingly sturdy, even with this modest 6mm diameter on offer. The load capacity sits at 1,890kg and you also get a decent 18.5kN breaking force rating. We thoroughly test our stainless steel rope once it has been manufactured to ensure it meets safety standards. Of course you might not be using it for lifting, in which case it is still good to know that it can withstand a good amount of weight and fatigue. 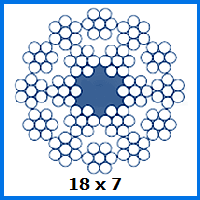 Choose our 18×7 rope and let us construct a completely unique assembly using it. For maritime use, or deployment in any other field, this rope can be equipped with fittings, including fully compatible stainless steel ferrules. Buying with Rope Services Direct lets you choose the length of rope we supply, along with any other adaptations you deem essential. Customising an order with us is incredibly straightforward and impressively cost-effective. Find out about our wire rope products and production solutions by emailing from our site or giving the RSD sales staff a call on 01384 78004. There is no obligation to buy immediately and quotes can be provided to ensure total transparency. 6mm 18x7 Stainless Steel Wire Rope Overall rating: 5 out of 5 based on 6 reviews.